Great-Uncle Dave brought my Great-Aunt Helen into the family. Aunt Helen was tiny, with snow white hair and a pretty smile. Aunt Helen was Polish and Roman Catholic. Growing up she was the only person I knew who had a picture of the Pope in her home (the rest of us were not Catholics). Being Polish, Pope John Paul II meant the world to her. My own conversion to the Catholic faith made her just as pleased as punch. Aunt Helen is responsible for one of my family's heirloom recipes, Poor Man's Cake. This recipe came out of the rationing that was done during World War II, when you had to use your eggs judiciously. This cake doesn't call for any eggs at all. And if there were recipes I post here that I could somehow force people to make, this would be one of them. This cake is fantastic, beyond what the simple list of ingredients would indicate. Put raisins in 2 C of water in a saucepan and cook on med-high heat for 10 minutes. Remove from stove. Add 1 C cold water and 1 t of baking soda; stir. In a large bowl, mix sugar, shortening, salt, cloves, cinnamon, and nutmeg. Add raisin / water mixture. Add flour, mixing well. Pour into a greased cake pan. Bake at 350 for 45 minutes or until done. This cake is perfect for fall, full of raisins and spices, and it's very moist and dense. Absolutely a family favorite of mine! Visit Rachel for more wonderful recipes! Sounds yummy,perfect for fall like you said! Love these kinds of recipes! What size box of raisins? The big family size, or the more traditional, individual box? In Germany we know these cake too, also due to WW2 at least it made hungry people creative ! Meredith- the traditional, standard size box of raisins. Looks and sounds great...will definitely add this recipe to my own, thanks. I sent this to my mama! I love family recipes. They are the best. Sounds yummy. I wonder though, whether cooking the raisins is necessary nowadays. Raisins used to be really hard and needed to be softened to be edible, but whatever they put on raisins now keeps them soft, so the softening isn't needed. I also wonder how softening them in rum would taste. Not to go messing with your family recipes, Amy. Just pondering. This sort of baked good is really up my alley. I'm adding Poor Man's Cake to the growing list of your recipes that I must try (Lucy's Salad, now this). I am SO all over this one. OK, this week. Wait, check that - it's supposed to get hot again. Over the weekend, and it can go in the snack bags for school. I shall report back. Jamie (BlondMom) my daughter sent this to me. I featured it on my blog. 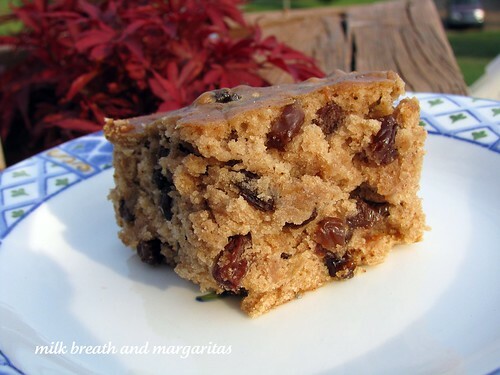 My grandmother made something similar and called it a raisin cake. I think I will 1/2 it and it will be my size for a few days. I could eat my weight in this cake - so mix one up and enjoy! This must be the cake I've been waiting to bake...as everything is already stocked in my pantry. No running to the store. Yay! Hi, I'm here from One Woman's Journey. I think that this cake is so interesting. If it tastes as good as it looks...it's a winner. This looks yummy. How is the weather there? My sister and her family live in Donelson and I have a very soft place in my heart for Nashville and Tn. Looks like a perfect fall cake. Makes me want to make some Chai, too! This is awfully similar to my grandmother's Spice Cake. Most of my grandmother's recipes have no eggs. Pretty cool. PS - Jordana, cook the raisins! They're so sweet and plump. I use golden raisins for this cake. I got a similar recipe for Poor Man's Cake from my Grandmother. It dates from early 20th Century. Best to use Seeded Muscat Raisins (Goodle them!). Boil all ingredients except flour and leavening for 15 minutes, cool. Mix flour and leavening, bake in ring form. Food of the Gods!